Like most other families, we feel that the most important part of the Summer Holidays is having fun (not to mention a well deserved break from all those term-time early morning get ups!). 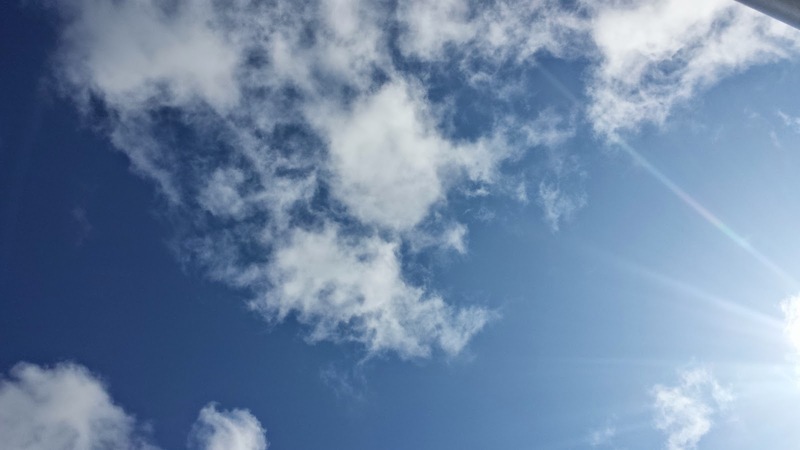 However, every year the summer flies by all too quickly and we also need to make the most of this precious time to get ready for the new school year. 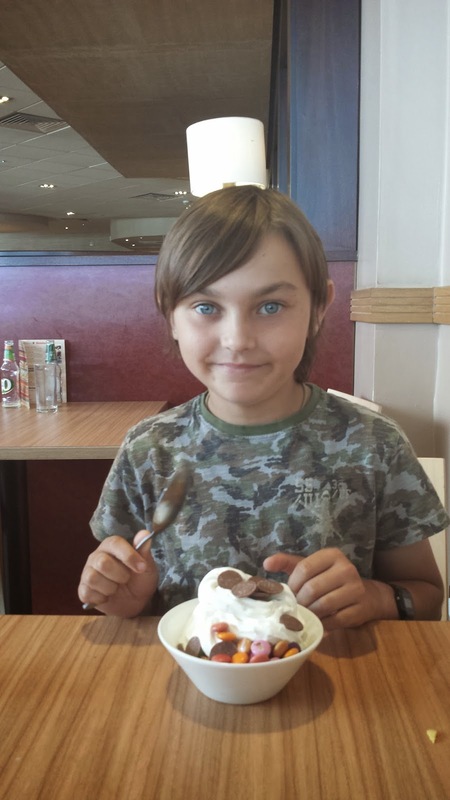 This year, I may have found the perfect way to combine back to school shopping with a fun day out- result! 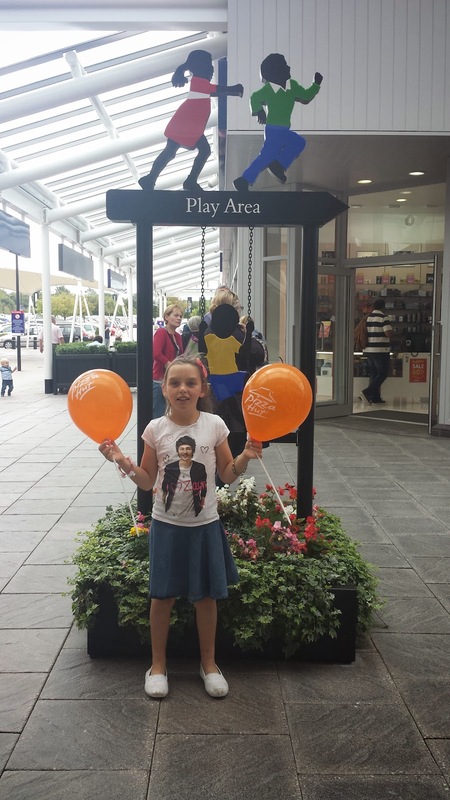 We were invited by Mumsnet and McArthurGlen to visit their Bridgend Designer Outlet. I have popped in a few times (usually for a coffee break whilst travelling) but this was to be the first time I had spent a whole day shopping there. I know some people cite “shopping” as a hobby. Whilst I like having pretty new things I generally find shopping a stressful activity to be avoided whereever possible (especially since having kids! ), so I was interested to see if we could have a both productive and enjoyable day of school shopping. We set off with smiles on our faces. 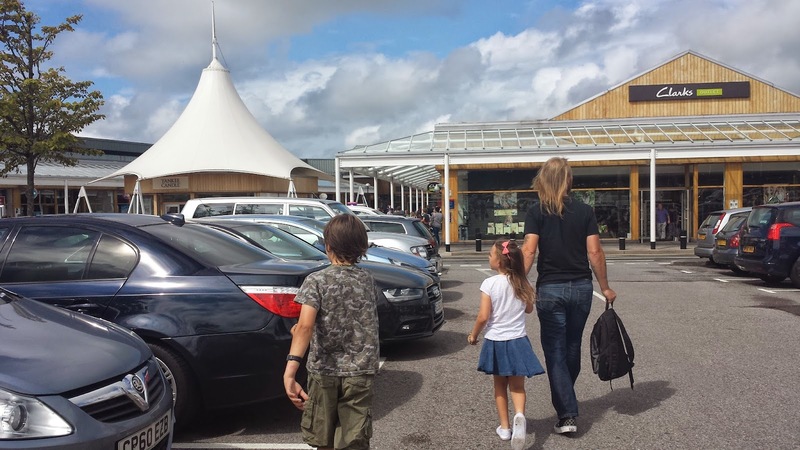 Bridgend Designer Outlet is very easy to drive to and is located just off Junction 36 of the M4 Motorway. There is ample free parking available. We arrived at 11.30am on a Saturday and I managed to park close to the shops. There are also overspill carparks available for peak shopping times. Walking from the car to the shops where we were parked there were no designated walk ways, but we managed to walk past the cars safely and with no problems. After our car journey, I was relieved to find there are plenty of toilets at Bridgend Designer Outlet. 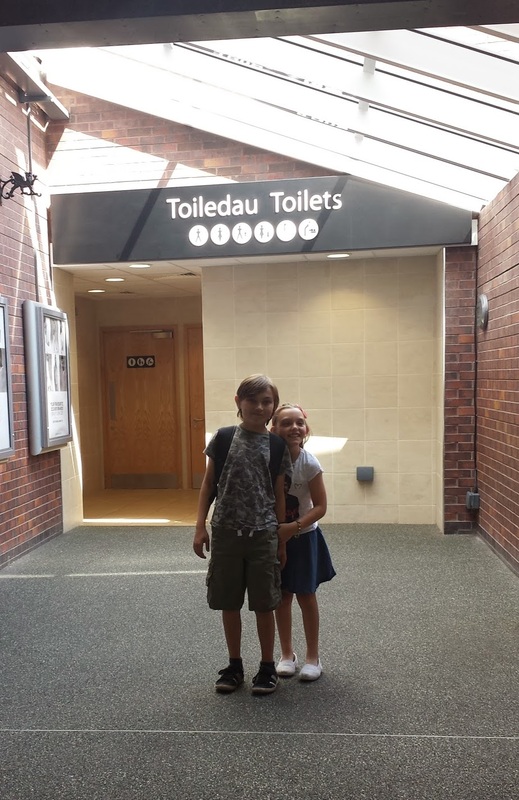 Toilets are located at regular spaces throughout so you are never far from one- great to know if you have young children with you! They are also clean and very well maintained. 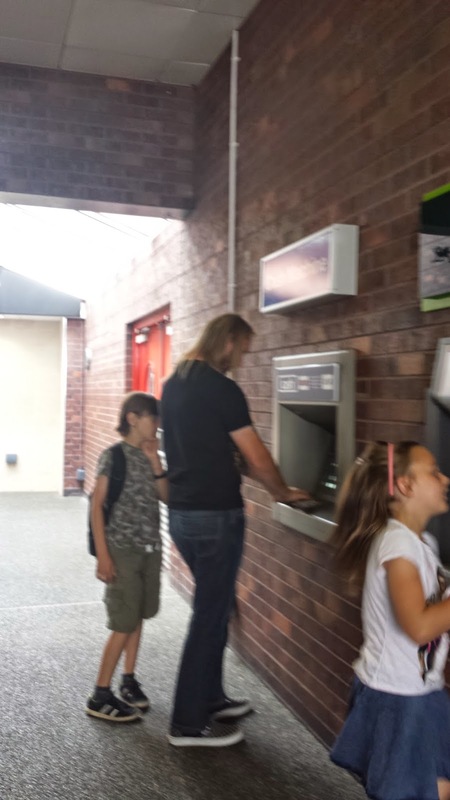 There are also cash machines, telephones, an Information Point, wheelchair and Kiddy Cabs available to hire. These are all located at the Restaurants side of the outlet so I would suggest that you walk in that entrance (of course we did the opposite to this and walked in the Yankee Candles entrance- I blame the lovely smell drawng me in!). If there is a particular restaurant that you plan to eat lunch in then you could book this on your arrival to guarantee a table. 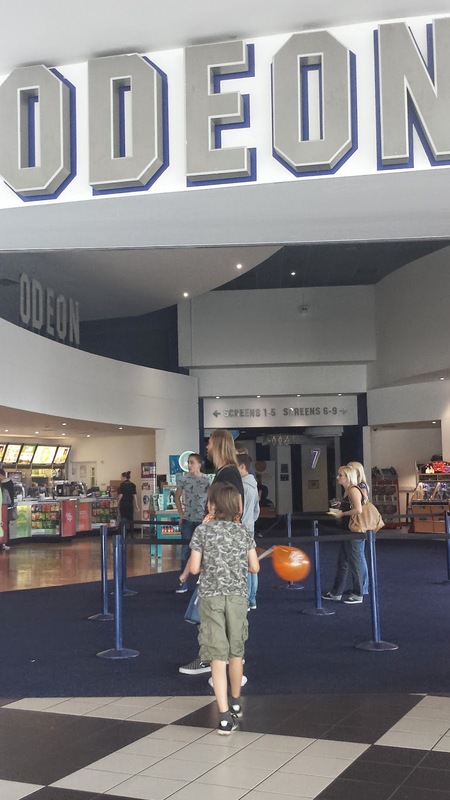 We also booked our cinema tickets too as a treat for us all after a long day of shopping. Our first stop was to Clarks. I always buy our main school shoes from Clarks (the kids usually have a supermarket pair too as a spare). I always buy them in our local branch of Clarks so was interested to see what the shopping experience in a Designer Outlet would be like. The store was spacious so even with lots of other families having the same idea there was plenty of room. 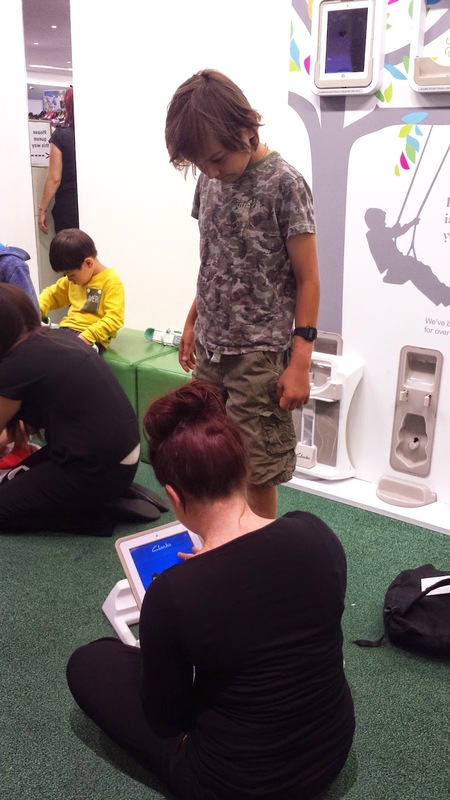 We joined a very short queue and the kids were soon called up to have their feet measured. Their sizes were noted and then we could go off and find the styles the liked and try them on. The kids preferred this to sitting down waiting for the staff to bring out styles in their sizes like they usually do. We found Rebecca needed to go a few sizes up compared to her measured size as she has quite a high instep and the style of shoes she tried was too narrow on the toes. The staff were very friendly and helpful and once we had found a few pairs which we liked we were directed to the fitting section for the staff to check the chosen styles and size were suitable. Very quickly we had acquired two new pairs of school shoes for a lot less money than I normally spend on them. The only differences we found were they don’t stock the toys in shoes at these branches of Clarks and we didn’t get shoe boxes. However, with two pairs of quality, well fitted school shoes and savings of £38, this was fine by me. I will definitely be choosing school shoes here again next year. Clarks also had a great range of schools bags and labels. I spotted a Jake and the Neverland Pirates school bag that Caitlyn would have loved but admit I forgot to pick it up with my excitement over the sorting of school shoes for another year! There are a lot of surf, adventure and camping types of shops and we found these good for school coats and bags. Being a born survivor and true Scout, Danny is more interested in the practical elements of his clothes than the style. He was happy to find a 3 in 1 Style Coat and a Rucksack in the Trespass Store. Here we saved £30 on the coat and £13 on the rucksack, making a total saving of £43. 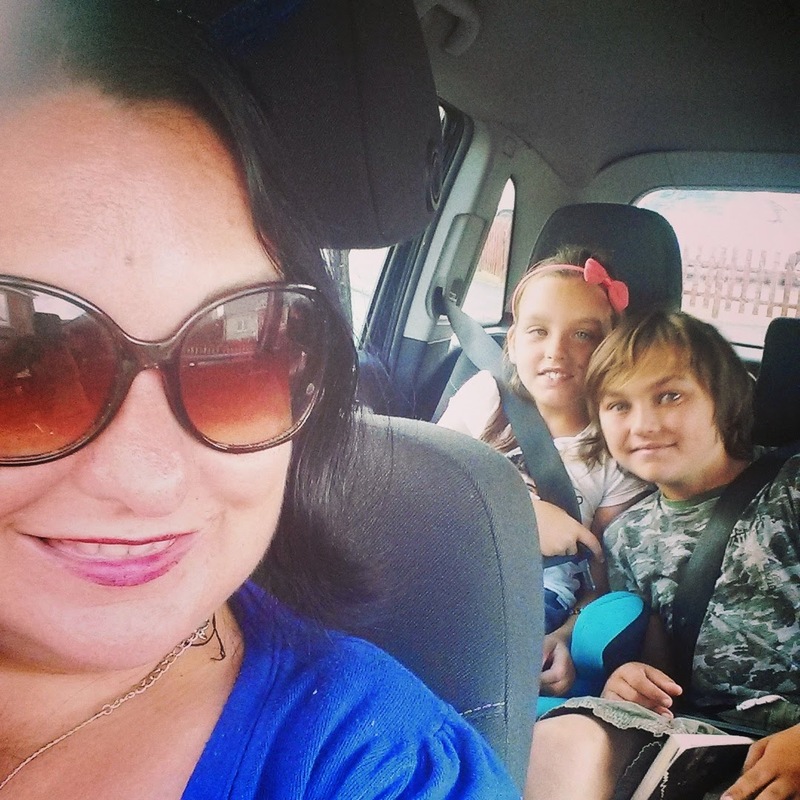 We got our back to school stationery and a few “just for fun” shopping treats at The Works. I may have treated myself to another new notebook too. 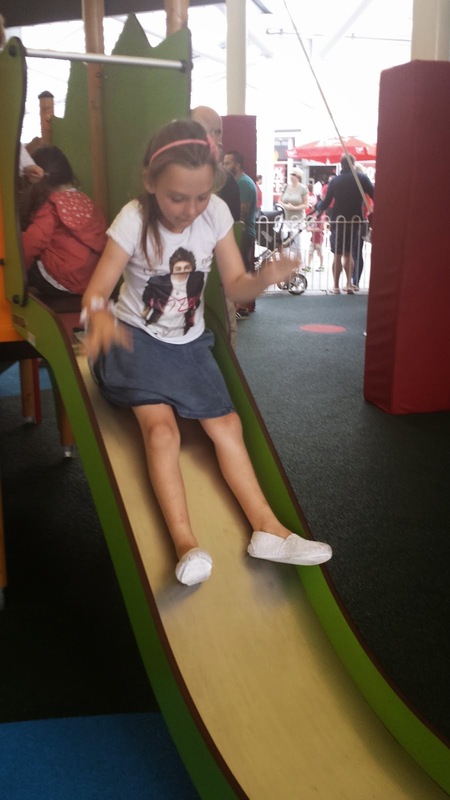 The kids love The Works (especially our local one which Uncle Andy manages) but they would like to see more toy shops at McArthurGlen as in their view you can never have too many toy shops! I would love to see a Disney and Lego store moving in there! 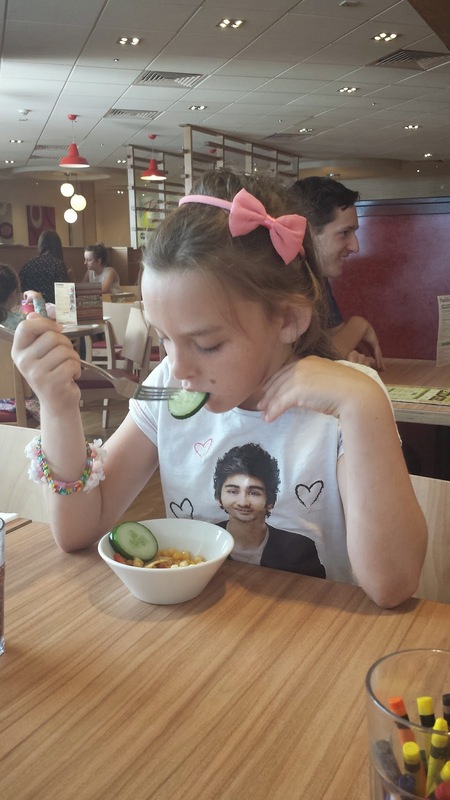 After a successful morning shopping it was time for my favourite part of the day- lunch time. 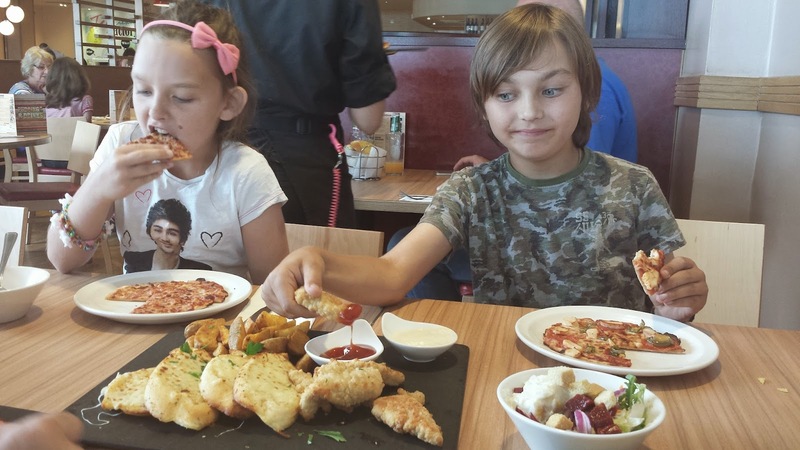 We had unanimously decided on our family favourite, Pizza Hut, but there were lots of great restaurants to choose from including Frankie and Bennys, Macdonalds and KFC. We love the unlimited salad bar. 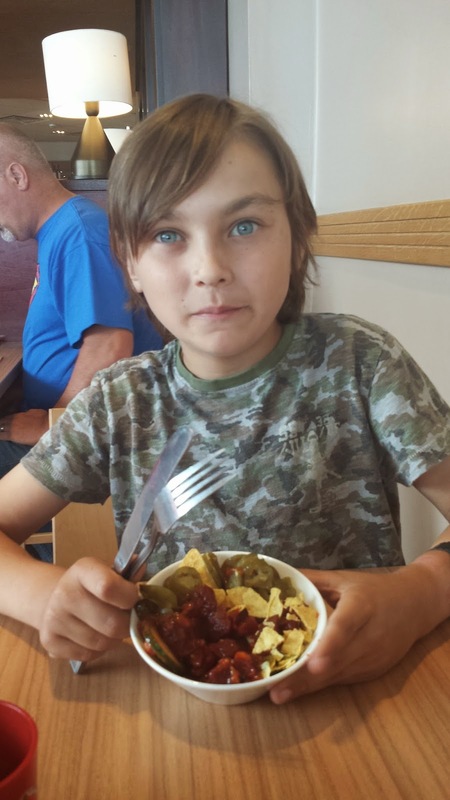 Danny enjoyed Nachos, salsa and chillis, while we had more traditional salads (with added potato salad and croutons for me- delicious!). We all had a pizza each and one platter to share. We found this very satisfying and I was too full to try any of their delicious desserts, thankfully Dave and the kids managed to eat some though. 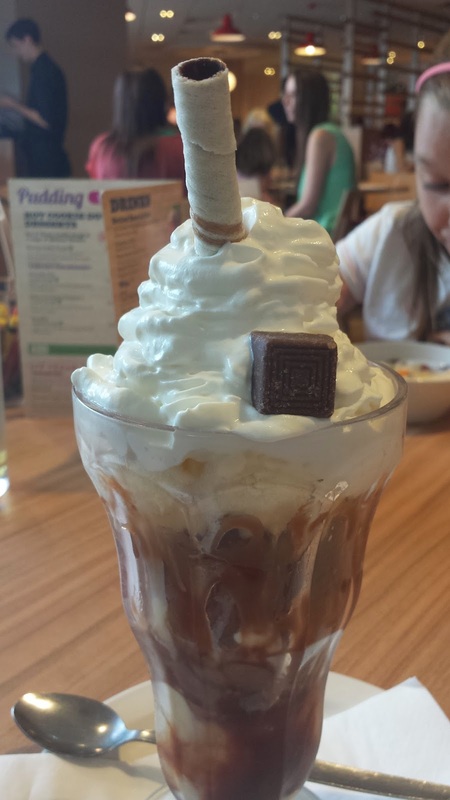 Whilst Dave enjoyed this stunning sundae! He did make me giggle requesting for it to come without the sparkler though! Surely that’s the fun part? We really enjoyed our meal and the kids even got a balloon each. 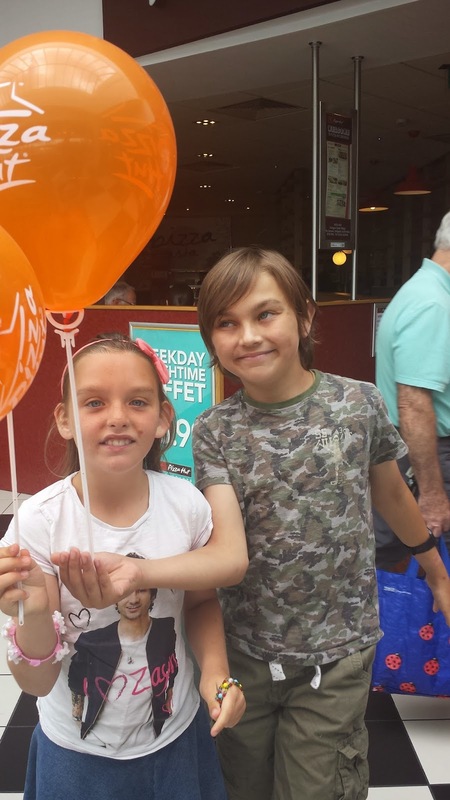 They were very sweet though and when a little boy was crying as he wanted one of their balloons they were eager to hand it over to him and made his day, bless them. Heart FM were at Bridgend Designer Outlet for the day hosting a fabulous competition and recording customer Vox Pops. Danny and I recorded one each so let us know if you hear us on the radio! There is a Play Area at the outlet, conveniently situated next to toilets and a Sidoli’s which does great ice cream and hot drinks. A perfect rest stop. It was only recommended for children aged 7 and under though and I know my eleven year old would appreciate a run around still so an older play area would be great. 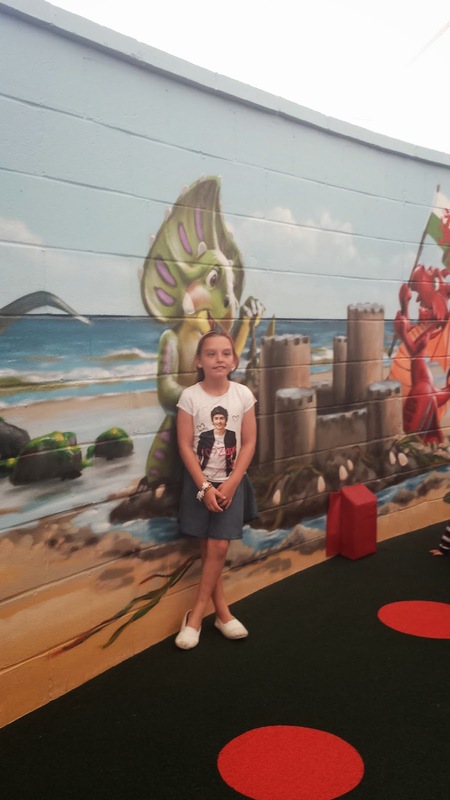 The walls are decorated as “Dinoland” and I love the Welsh Castle and Dragon theme too. 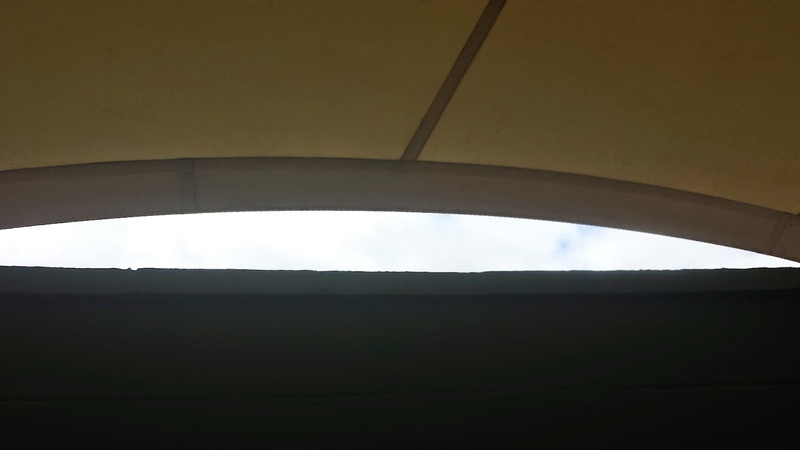 The play area is under cover so can be used in all weather conditions, but due to the open canvas style roof you still get lots of fresh air so it doesn’t feel stuffy like indoor playgrounds. With all our school essentials bought and children fed and entertained, it was time for us to look around some shops for treats for us. Dave looked for some new Vans (the checkout assistant admired the Vans he was currently wearing). I stocked up on toiletries at the Body Shop and some new Yankee Candles. I saved £47.49 at the Body Shop. I also got a free birthday gift so that was another successful shop. Danny loved picking up bits and bobs in the surf shops, especially Salt Rock. 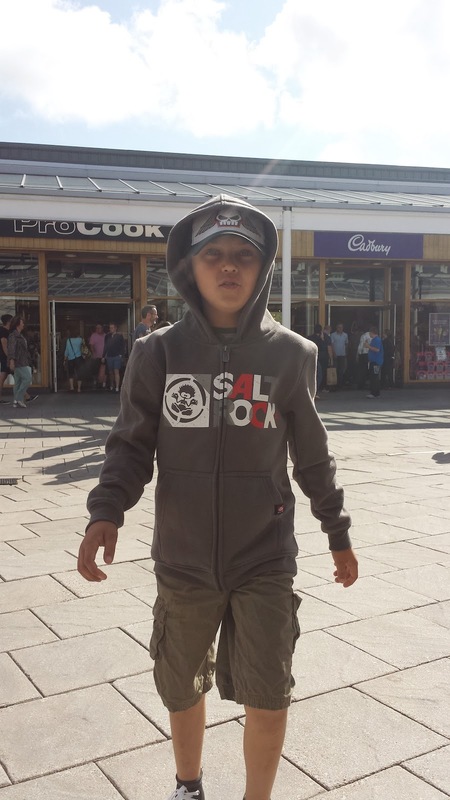 He liked to wear his new buys straight away- he looked like a different boy by the time we went home! 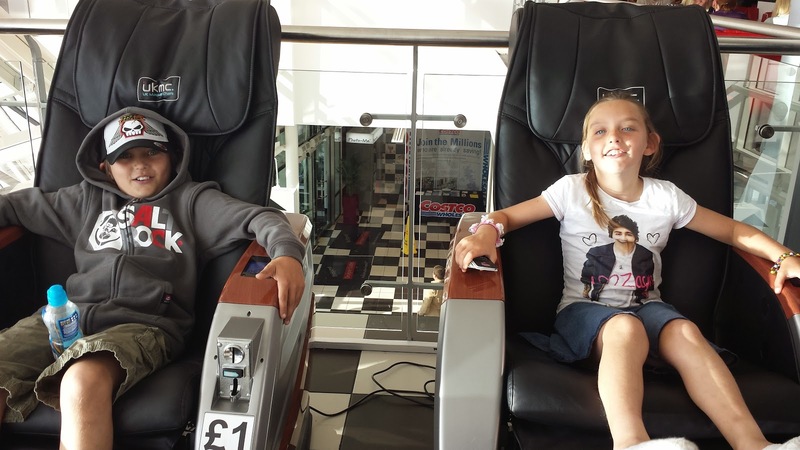 While waiting for our film to start we had a go on the Massage chairs. This was just what I needed after a day of shopping. Then it was time for our last treat, movie time! 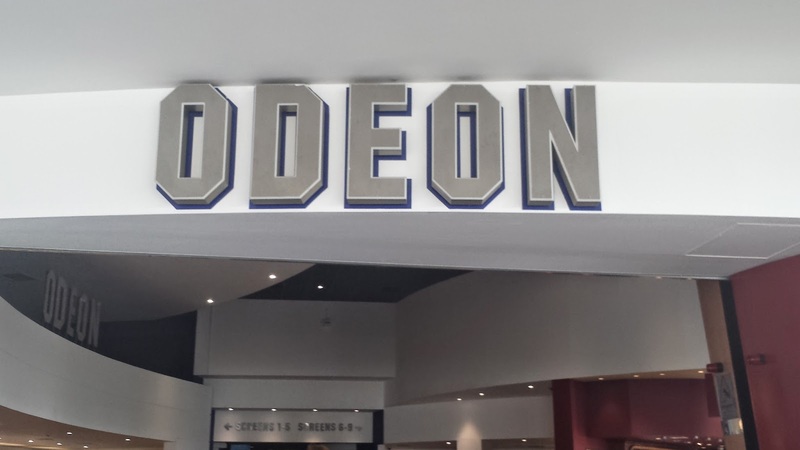 The kids chose different films to watch so I went off to watch How to Train your Dragon 2 with Rebecca, and Dave took Danny to watch Guardians of the Galaxy. We all enjoyed our films, the popcorn and the sit down too if I’m honest! Having spent over ten hours at McArthurGlen we still went home smiling (and the kids trying to stay awake!). It was a great day out. We got everything we wanted, we saved lots of money and most importantly had lots of fun. I think it’s great that you can visit there whatever the weather. We visited on a sunny day with showers. When it rained we were kept dry as there is plenty of cover. However, when the sun was shining we still felt the cool breeze just like we were outdoors. I usually get a headache from shopping (either caused by the stuffiness or my kids I’m not sure!) but on this occasion I came away head ache free. I will definitely be visiting again in Autumn to stock up on Christmas gifts (one visit to The Gift Company and I’d be sorted I think!). We will also return next Summer for our back to school wear again. Now we have visited the cinema I think we may consider popping in on the way home to catch a film to end off our day nicely. Whilst we were there Catherine, the Marketing Manager, explained to us that the Centre is currently undergoing a £2.5 million pound makeover. She apologised for the work going on while we were there, but I can honestly say that the place looked great and we were not affected by the improvements taking place. Thank you for a lovely day out Mumsnet, McArthurGlen and Catherine. We can’t wait to visit again! Looks like a great day out, we tend to make a day of it when we visit with shopping, food & cinema, I love going there!